In case you haven’t noticed, spring has definitely sprung here in Pottstown. The view down my own street in the East End has gone from bleak to bursting with color in the span of just a week and even the stubborn sycamore tree outside my front door has finally decided to join in the fun and get some leaves. Now that Pottstown has woken from its long winter’s nap, it’s time to look around your neighborhood, pitch in and clean up. And, the Borough is there to help. Tomorrow, Saturday April 30, from 8am to 12 noon, the Borough of Pottstown is sponsoring a Clean Up day to help residents and business owners clean up the streets and sidewalks after that long winter. There will be dumpsters stationed at Borough Hall and at the Empire Fire Company on the corner of Franklin and Chestnut Streets. You can get some friends and neighbors together to spruce up your own block or come downtown and join the larger effort there. The weather looks like it is going to be perfect for getting out and re-connecting with nature and your neighbors! Kick off the month of May, which is also the Month of the Young Child, with a celebration at the Pottstown YMCA, sponsored by the PEAK program for early childhood education. The event will feature fun and games for kids (all free) and community groups will be there in force to help families learn about the opportunities for young children in our town. Also, on Sunday, bring that pollen covered car to the NorCo Fire Company between 9am and 2pm and get your car washed by some of Pottstown’s own Rockstars. 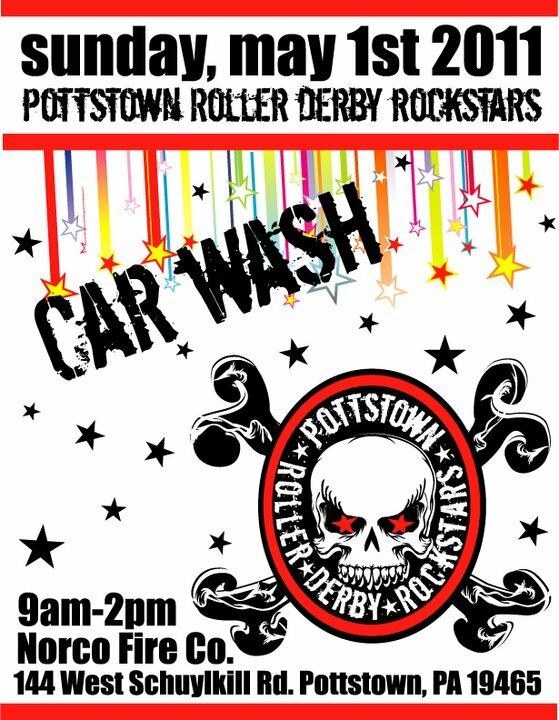 That’s right, the Pottstown Roller Derby Rockstars are holding a fundraiser carwash on Sunday and there will be derby merchandise and bake sale items to buy while you are waiting for your car to be done. While not technically the weekend, this event will be a great way to ease into the work week and help a good cause. The Tri-County For a Cure team, who you will remember from the video last month a the Positively!Pottstown Happy Hour, is still raising money for Yoga on the Steps. This time, they’ve got Rita’s chipping in to help. Just come to the Rita’s Water Ice on Route 100 near the intersection of Pughtown Road between 6 and 9pm and your purchase will help the team raise money for the Yoga on the Steps event coming up in just a couple of weeks. It’s bound to be a busy spring weekend here in Pottstown and may actually turn out to be a sunny one as well, so take advantage of all that’s going on in your hometown! Get off to a great start by cleaning up from winter so we can all enjoy a beautiful spring here in Pottstown. If you’d like to see your event here in our calendar, be sure to send us an email or check in on our facebook page. We love to spread the word about this town!